Ann Marie Meaney and John Leneghan the female and male club champions from 2017. Some 400 triathletes from all over Connacht and indeed the country will descend on the town ensuring a very exciting event. In six years the race has grown from less than 100 participants to the high numbers it currently enjoys. The triathlon is very suitable for first time triathletes and improvers as it is a very safe, calm, flat course. In addition this year for the first time there will also be a Try-a-Tri event which will have a shorter swim distance (300m ) in its own dedicated race – which is ideal for first-timers or those less confident with the swim. 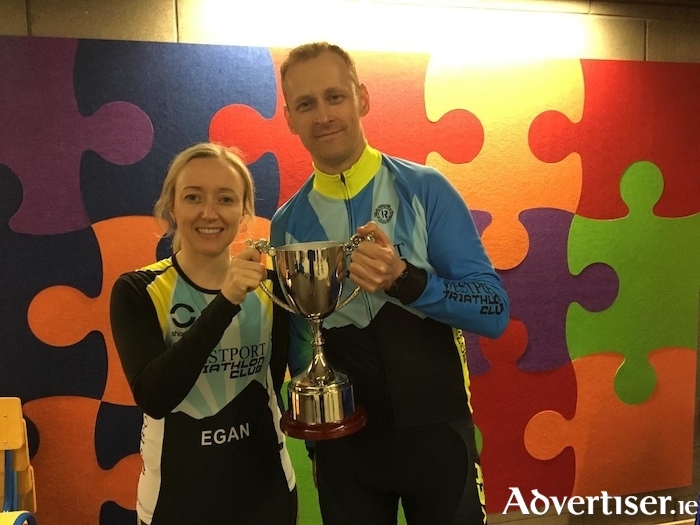 The Westport Triathlon has been designated as a Triathlon Ireland National Series event and Westport Triathlon is currently the largest triathlon club in Connacht. Race director, Tommie Loughran, said: "Getting National Series designation from Triathlon Ireland is a huge coup and a vote of confidence in Westport Triathlon Club. "It shows that we've been running a really successful race for years and gives us a chance to showcase our fantastic course to hundreds of competitors, many of whom will never have been here before. "We have over 250 people travelling from outside Connacht and they also make a valuable contribution to the local economy as many will stay for the weekend, bringing families and friends with them." As with all triathlons the event entails a combination of a swim, a cycle, and finally a run. The sprint distance event is 750m swim in a very sheltered area at the Quay in Westport close to The Towers. The cycle is 20km long and is very flat, it goes out the coast road, turning around at Bertra and ending back at the Quay. The final component is a 5km run around the grounds of Westport House. The Try-a-Tri distance event has a reduced swim distance of 300m, and it follows the same cycle and run route as the sprint race. This year thanks to the support of Portwest and Westport House the finish line will again be in Westport House, adding an even greater attraction for those taking part. All abilities are welcome and if you have always thought about giving triathlon a go this may be your ideal opportunity to start. If you are a cyclist, runner, or have just received your new swim for a mile recognition and are looking for a challenge, Westport Triathlon on June 16 may be just what you are looking for. If you would like to take part in Westport Triathlon or are interested in joining the club, see entry details on the website www.westporttriclub.ie or the Facebook page. The annual Westport Triathlon Club fundraising quiz will also take place on Thursday April 19 at 8.30pm in the Clew Bay Hotel. There will be great prizes on the night. Westport Triathlon Club is entirely a voluntary organisation and relies on fundraising activities to support initiatives in the community. All are welcome for a sociable evening and all support is greatly appreciated.